Wissy's blogspot: Brother and Sister. Yes! They have the same eyes! They look fond of each other, why the 12 year absence? Congratulations on a successful Diamond Jubilee. I saw some of the fun ways British people dressed up with face paint and silly hats and totally loved it. That's very cool about members of your family seeing each other after so long apart. Terrific photo that I'm sure you'll keep and cheris. Thanks for your kind comments. 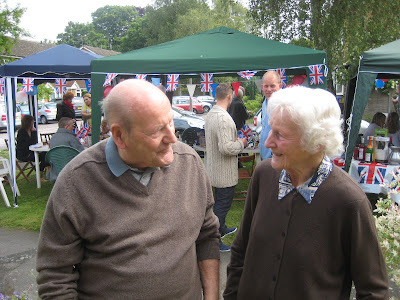 It was lovely to see my Mum and Uncle meet after all those years apart. As an aside, after having a terrible year my wife and i have booked holiday away (we haven't had a proper holiday for years) and we are going to Kalkan in Turkey. We won't make it to Instanbul but i will be thinking about you!